America is a rock band formed in England in 1970 by Dewey Bunnell, Dan Peek, and Gerry Beckley. The trio met as sons of U.S. Air Force personnel stationed in London, where they began performing live. America achieved significant popularity in the 1970s and was famous for the trio’s close vocal harmonies and light acoustic folk rock sound. The band released a string of hit albums and singles, many of which found airplay on pop/soft rock stations. The band came together shortly after the members’ graduation from high school, and a record deal with Warner Bros. Records followed. 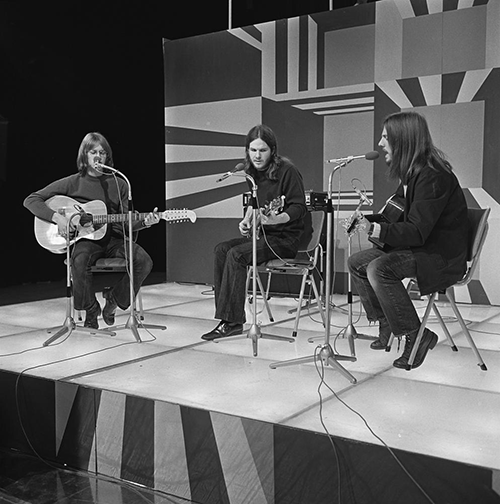 Their debut 1971 album, America, included the transatlantic hits "A Horse with No Name" and "I Need You"; Homecoming (1972) included the single "Ventura Highway"; and Hat Trick (1973), a modest success on the charts which fared poorly in sales, included one minor hit song "Muskrat Love". 1974’s Holiday featured the hits "Tin Man" and "Lonely People"; and 1975’s Hearts generated the number one single "Sister Golden Hair" alongside "Daisy Jane." History: America’s Greatest Hits, a compilation of hit singles, was released the same year and was certified multi-platinum in the United States and Australia. Peek left the group in 1977, and their commercial fortunes declined, despite a brief return to the top in 1982 with the single "You Can Do Magic". The group continues to record material and tour with regularity. Their 2007 album Here & Now was a collaboration with a new generation of musicians who credited the band as an influence. America won a Grammy Award for Best New Artist at the 15th Annual Grammy Awards. The group has been inducted into the Vocal Group Hall of Fame and received a star on the Hollywood Walk of Fame.